Mark Harmer (yawn) wins again (getting boring) at Bartles Lodge this week continuing his great run of form. Round 24 this week comes from the very pretty and prolific Bartles Lodge. 12 members made the journey this week. Very warm weather was forecast for this week which is very welcome. 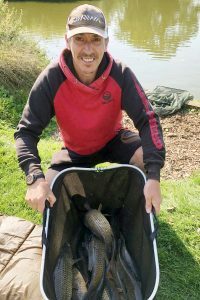 Having made the draw and everyone was ready to see if it would be their lucky week.once again it was Mark Harmer who came out on top again this week. Mark was on peg 10 and caught 56 carp tight down the edge for a winning weight of 133lb 10oz. So that’s now 7 on the trot. 2nd place was the ever consistent Mark Charlwood. Mark was on peg 1 and caught carp steadily all day for a total weight of 102lb 7oz. 3rd place was Dave Dearman.Dave was fishing the hot peg 4. 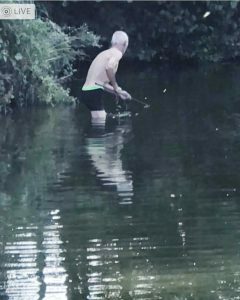 Dave started the match like a man on a mission catching 2 fish before anyone else had put a bait in the water. But unfortunately for him the bits faded but he weighed a very good 76lb which made up for last week when he had to leave early. Great white hunter searching for his top kit! 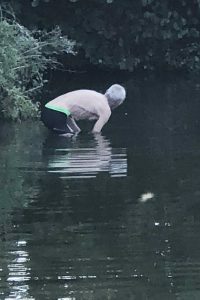 Must just mention that Mr Agass had to take a dip at the end today to retrieve his number 4 and top kit which went for a swim. And yes he did get it back. Next week it’s Colton on the Barford Complex.